This BBQ was held in the hot summer month of July! We all did our best to stay cool, but we were lucky it wasn’t as hot as some other days. We started later in the afternoon to avoid the hottest part of the day. All students and their families were invited to attend. It was a very relaxed atmosphere and everyone had lots of chances to talk to each other. A couple of English-speaking friends from abroad added to the mix of people. 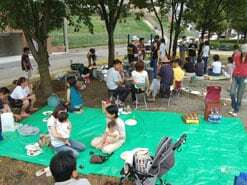 Everyone was told we would provide all food and drinks (no charge), but many people brought a small dish or something to drink as well. It was not necessary, but much appreciated! 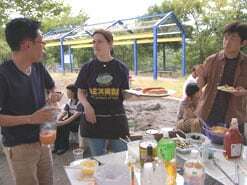 We had the usual Canadian BBQ foods such as American style hotdogs (dog and buns specially ordered for this event) and homemade salads with a variety of softdrinks and some beer. Some students brought more delicious salads and fried dishes. How delicious! 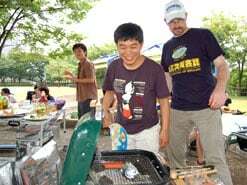 Our friend, Mr. Kim, cooked the hotdogs on the BBQ, and everyone helped with clean up. Yoko brought her car, so she kindly helped us bring everything back to the school after it was all over. We enjoyed the BBQ until sundown. What a great day! Thanks everyone!